The Vaughn 2200 Pro Goalie Neck Protector offers top of the line protection for the pros. The 2200 Pro throat guard is constructed from an injection molded Lexan® polycarbonate material with a raised edges for added rigidity and stiffness while improving puck deflections. The tough Lexan® material is also superior for shock resistance and provides maximum durability and visual clarity. 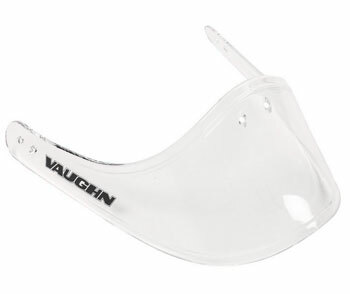 Vaughn&apos;s 2200 Pro throat protective shield is designed with a wide profile and flared lower edge allowing the guard to fit tight to the upper chest as well as gives a wider area of coverage to the neck. The Vaughn throat protector comes with three nylon strings and mask clips making that make attaching the throat guard quick and easy.